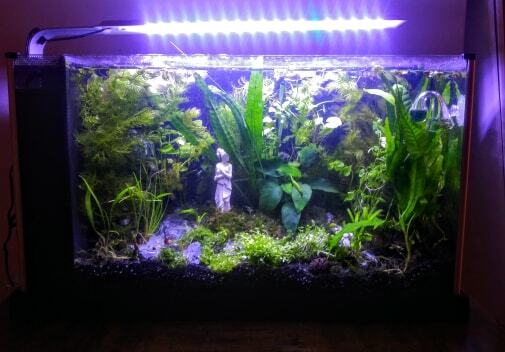 The Planted Tank Forum > General Planted Tank Forums > Planted Nano Tanks > How to make this scape better? How to make this scape better? New to this forum and to freshwater planted tanks, but used to work at a non-profit as a marine aquarist. Missed it so much that I decided to get a little Fluval Spec V. I love the look of planted tanks, but I'm not sure how I feel about my tank at the moment. It's been 2 weeks for the tank as a whole, and about a week for the corkscrew vals that are melting... Just added root tabs to see if it helps. Not a fan of the roots that are showing, but since I planted some of these with a full tank, I guess it's to be expected. Anything I can do to hide them better? I have some tannins in the water from the driftwood, but I don't really mind the color and figure it'll fade with time. Will that be an issue for the plant growth? Feel like the scape is a lil disorganized too...any ideas to make it prettier? Thanks! Update: Looks like this now! I liked this piece by green machine which game me a good starting point. Thanks! In a small tank like this, and given the driftwood/plants I have, which one do you think would look best? I was trying to make it busier towards the left of the tank, and calmer on the right. Filled it up to the top with water and hid the thermometer and heater to make it look a little tidier too. Filling the tank closer to the top should do wonders for the overall look. Have you tried rotating the driftwood a bit? Moving the left side closer to the front and the right closer to the back should give a bit more perception of depth. If the exposed roots bother you, just push them deeper into the sand with a finger. Moving a finger gently in a circular motion will mix the roots with sand, helping to keep the plant down. I see some bright red shrimp in your future. You don't really need that thermometer stuck on the front glass either. I fill my spec V to the top and angle the nozzle in an upward direction. It causes a good ripple at the top. I'd say the triangle would look best but just my opinion, try having a play about some of the guys use a cardboard mock up it's much easier than stiring the tank. OK, this is just my opinion so you can take it however you want. I was going to do my tank with this guy but I could not find a good version of the ship to put in the tank as well. I was going to go for the alien world look on it. Nothing so barren as LV-426 but something green more like Planet 4, the Engineers home world. Cinnamonamon and redneck joe like this. I also have a spec V, great all in one tank but its width makes it challenging. My spec V is pretty busy because I have shrimp and a betta together so I needed lots of hiding spaces for the shrimp. If thats not a consideration then this is what I would do (just my 2 cents since you asked). 1) Put the heater in the pump section, it will fit fine but you will probably need to lose the suction cup, its not needed anyway this gets it out of the way. 6) Take your shorter plants and put them on the right side of the tank away from the filter wall. This will give you the "triangle" look that is so appealing to so many with the shorter plants leading to the driftwood leading to the taller plants. 8) Personally I don't like blackwater setups, if you do then ignore this piece of advice, but for me I would take the wood out and boil it to get rid of tannins. Obviously if you choose to do this, do it before you attach moss. 9) Not entirely sure what I am looking at, is the giant mass in the middle all driftwood or is it stone?? If stone you either need to remove some of it or all of it, its too big and is blocking the flow of the tank, if its not all one piece try putting in smaller bits, if its wood then try turning it a bit, so its not so high up. 10) As others have suggested you should fill the tank up to within .5" of the rim. Basically high enough so that your floating plants are not quite touching the lid. Again just my two cents, I will be the first to admit I am not great at aquascaping, but I happen to own the exact same tank and have thought a lot about how to get the most out of it. Thanks for all the advice! I ended up completely rescaping it after posting, so it looks like this now! I'm a lot happier with it now. tredford, Cinnamonamon and Pythos like this. Absolute world away from the original great job.